Easter weekend……… and other news! There will be a Picnic supper dance on Good Friday with live music for ballroom and sequence dance from Alan Cookson. Admission 5.00 on the door. Please bring along your own Picnic supper. 7.30.p.m – 11.p.m. Come along on Saturday morning from 9.30.a.m and enjoy bacon sandwiches, hot buttered teacakes, homemade cakes and traditional Easter Fayre. A book stall and fun raffle will also aid funds. A Flea Market, Collectables, Vintage and Crafts Fair will be held on both Easter Sunday and Monday. Some stalls will be there for just the one day, some for both, so its worth calling in on both days as there will be different stock each day. 50p admission. Open 10.a.m ( please call sooner if it fits in better with your days plans as most stalls are set up by 9.a.m. ) until 4.p.m. Light refreshments available until 3.p.m. Outdoor plant stall on the Sunday. Enjoy a game of table tennis? We are delighted to inform everyone that we have purchased a table tennis table and the sport can be played on a Friday evening from 6.p.m until 10.p.m. Please contact Peter for further details: 01756 748758. The Christians in Gargrave group will be hosting a Village Spring Fayre at the Village Hall on Saturday from 10.a.m until Noon. 2.00 admission to include Coffee and homemade buns. Lots of stalls, Crafts, Pre-loved, Cakes, Manorlands stall, Chocolate Tombola, Egg painting, Easter bonnet competition and games, something for everyone. Guest appearance by The Village Choir. Proceeds in aid of the Isaiah Trust ( Kenyan street children ). Don`t miss the busy Easter weekend, Picnic supper dance on Good Friday with live music for ballroom and sequence dance from Alan Cookson.Village Hall Management Coffee morning on Easter Saturday, followed by a Flea Market, Collectables, Vintage and Crafts Fair on both Easter Sunday and Monday, different stalls each day ( some will be there for both days ). Only 50p admission. A Coffee morning will be held on Saturday ( 6th April ) from 9.30.a.m. Tasty bacon sandwiches, hot buttered teacakes and homemade cakes will be on the menu. Playing cards and dominoes will be available if anyone fancies a game. A book stall and fun raffle will also aid Village Hall funds. Gargrave Village Hall membership books will be available to purchase at 3.00 each, they are a handy pocket booklet with various contact numbers and event dates and it is also a way of supporting the Village Hall. They were printed at the start of the year and there are now further dates to add: 18th and 19th May Vintage Fair ( organised by Broadway Fairs ) 21st June Ribble Valley Jazz band, 21st July Afternoon tea with entertainment and 14th September Annual Jumble sale ( collection of goods has now started and donations may be brought along to any of the Village Hall Saturday Coffee mornings – but please no large electrical items, TV`s or Printers) . 19th and 20th October Craft Fair ( organised by Broadway Fairs ). A Coffee morning will be held on Saturday commencing at 9.30.a.m. Bacon sandwiches, hot buttered teacakes and homemade cakes will be on the menu. It will be the last opportunity to see and purchase photographs which were taken courtesy of Paul Chapman at the 60th Celebrations Sunday event ( if you came along and enjoyed the afternoon we are hoping to plan a similar event on Sunday July 21st ). A fun raffle and book sale will also aid Village Hall funds. Broadway Fairs will be holding a Flea Market and Allsorts Fair on Sunday commencing at 10.a.m until 3.30.p.m. Light refreshments available until 3.p.m. The weekend starts on Friday! A Picnic supper dance will be held in the Hall on Friday evening with live Organ music for Ballroom and Sequence dancing from Lancashire musician Elizabeth Harrison. The evening commences at 7.30.p.m until 11.p.m. Admission 5.00 on the door please bring along your own picnic supper. Hot bacon sandwiches, toasted teacakes and homemade cakes are on the menu at the Management Committee Coffee morning which commences at 9.30.a.m on Saturday morning. A fun raffle and book stall will also aid funds. Photographs taken at the Sunday afternoon 60th celebration event will be on display and for sale. The Gargrave hand bell ringers will also be in attendance and will give a demonstration of their hobby. Please come along as new members are always welcome and current members will be happy to have a chat and give more information about the art of bell ringing. Gargrave and Malhamdale Library in conjunction with Skipton Rotary club will be showing “Breathe” the true story of one man and his wifes fight against polio. An inspiring film starring Andrew Garfield, Claire Foy, Hugh Bonneville and Tom Hollander. All proceeds from the evening will go towards the Rotarys campaign to eradicate polio. The customery Café style seating will be in place so please bring your own refreshments. The evening is likely to be well supported so tables may be limited but there will be lots of seating. Doors open 7.p.m for a 7.30.p.m start. Tickets 5.00 on the door. Gargrave Village Hall Management Committee will be holding a Coffee morning on Saturday. Bacon sandwiches and hot buttered teacakes are on the menu along with homemade cakes. There will be a display and sale of photographs ( photographs taken courtesy of Paul Chapman ) which were taken at the 60th Celebrations Sunday event. A fun raffle, Book and CD sale will also aid funds. The Gargrave Village Hall Management Committee Flea Market, Vintage, Collectables and Crafts Fair is back on Sunday after a short Winter break. Lots of stalls with unique and affordable items. Only 50p admission. Light refreshments available until 3.p.m. Open 10.a.m – 4.p.m. Please come sooner if it fits in better with your days plans. Most stalls are set up by 9.a.m. If you love books then come along to the Village Hall on Saturday 9th March. There will be literally thousands of books for sale on every subject imaginable. Book sellers from all over the North West will be selling antiquarian, secondhand and some new editions, there will also be a variety of ephemera for sale. Open 10.a.m until 4.p.m. Light refreshments available until 3.p.m. Next Saturday we will be holding a Coffee morning when there will be a great selection of photographs on display which were taken at the 60th celebrations ( the Sunday event ). Photographs are courtesy of Paul Chapman ( see also the gallery on the website ). Photographs will be available to purchase on Saturday 16th. The annual Pantomime production will be taking place this weekend, commencing with the first performance of The Sleeping Beauty on Thursday February 28th at 7.15.p.m. The performance on Friday will also take place at 7.15.p.m and there will be two matinee performances on Saturday at 1.p.m and 5.p.m. Tickets are available from the Dalesman Café in Gargrave or cast members. 7.00 per adult and 5.00 for children and OAPs ( 8.00 and 6.00 on the door ). Come along and enjoy the story of Princess Beauty, Prince Michael, The Lilac Fairy, Black Fairy ( Boo ) and lots of other fun characters. Gargrave Village Hall Management Committee are delighted that the 60th celebrations went so well. The weather was perfect for the occasion and because of this Robert and his fellow members from the Craven Old Wheels were able to bring along their Vintage vehicles. Edward also had his 1950` Fergie parked alongside them. The 1959 classic comedy film was enjoyed on Friday evening. Many thanks to the Gargrave and Malhamdale community library for organising the event. A good crowd turned out on Saturday morning to view the display of Gargrave Village Hall memorabilia and also the display from Gargrave Heritage group showing the businesses and shops which were in Gargrave in the 1950`s. Coffee and bacon sandwiches and homemade cakes were an added attraction. The Swing City Big band played to a capacity crowd on Saturday night, the seventeen piece band and their female vocalist, Rachael were a huge success. Hattie Bee entertained the audience on Sunday afternoon with her songs from the 1950`s and Tom and Ellie from the Swingcats gave an amazing display of Swing and Lindy Hop dancing. A splendid homemade afternoon tea was also enjoyed. Many thanks to everyone who attended and special thanks to anyone who helped in anyway with the events – it was quite a weekend! Photographs will appear shortly. This weekend there will be a Picnic Supper dance on Friday night with live music from Brian Griffin who will be travelling all the way from Lockerbie. We are fortunate that Brian has stepped in at short notice as Bill Johnson is unwell. Brian will be playing the accordian. Admission 5.00 on the door, music commences at 7.30.p.m. No Coffee morning on Saturday due to a Pantomime practise. Tickets for the Pantomime on Thursday 28th February to March 2nd are available from the Dalesman Café, cast members or call 01756 749443 for more details. This years production is The Sleeping Beauty with Grace Barnes in one of the leading roles as Princess Beauty. Laura Lipscombe will be playing the villainous Black Fairy and Claire Addis the Lilac Fairy, will Chris Faulkner as Prince Michael wake the Sleeping Beauty??? Performances are at 7.15.p.m on Thursday 28th February and Friday 1st March and on Saturday there will be two Matinee performances at 1.p.m and 5.p.m. Members and friends of the Village Hall Management Committee have been hard at work preparing for the 60th anniversary celebrations which commence on the 15th February with a weekend of Nostalgia to celebrate the opening of the Village Hall back in 1959. Gargrave and Malhamdale Community Library will be showing the 1959 classic comedy film, Carlton Browne of the Foreign Office starring Terry Thomas on Friday 15th February. Doors open at 7.p.m. Admission is 5.00 on the door. Café style seating, please bring along your own refreshments. 1950`s dress optional, a prize for the best dressed individual or couple. A Coffee morning will be held on Saturday 16th February from 9.30.a.m until 1.p.m. There will be bacon sandwiches and lots of homemade cakes. Come along and browse Gargrave Village Hall memorabilia, some kindly lent from the Dennis French collection. Gargrave Village Hall membership books will be on sale and the Pantomime section will be selling tickets for this years production of The Sleeping Beauty ( 28th February – 2nd March ). The Swing City big band will be performing live on the Saturday night, reliving the golden days of big band music, similar to the opening night on February 14th 1959 when Bill Saville and his orchestra travelled from London to entertain a captive Gargrave audience. Doors open 7.30.p.m. Admission by ticket only – 7.50 each, available by calling 01756 749235/07989585564 or info@gargravevillagehall.org.uk. There will be a licensed bar and raffle. Bacon sandwiches available in the interval. 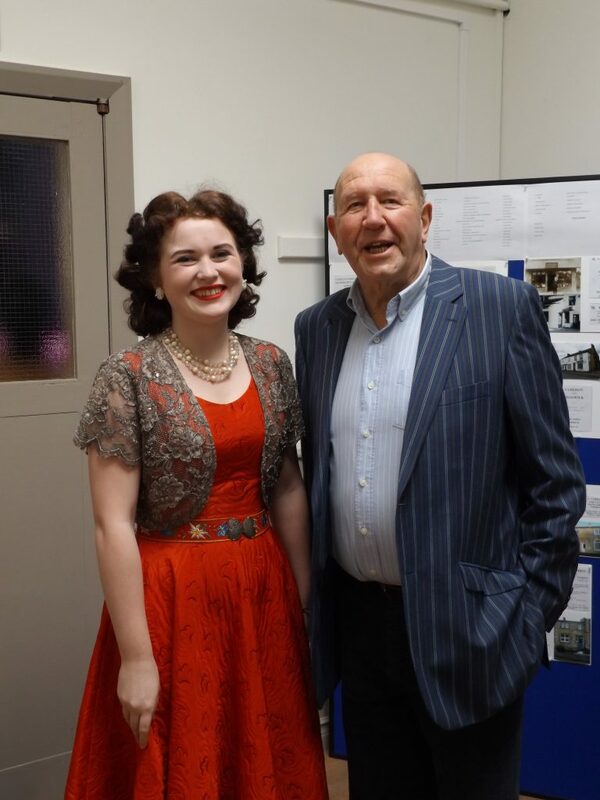 Vintage singer Hattie Bee will be complimenting the anniversary weekend with a selection of songs from the 1950`s on Sunday 17th February and there will be a further surprise performance in the interval – not to be missed! Doors open 1.30.p.m. Admission 7.50 per person which includes homemade afternoon tea. Please call the above numbers to reserve tickets. If you have a sweet tooth there will be a sweet cart where Vintage sweets can be purchased throughout the weekend. There are a few additional surprises lined up too including a visit from a classic car or two on Saturday morning and Sunday afternoon.